The P990i takes effective communication to new heights. You have everywhere access to the Internet, push e-mail to get your e-mail straight to your phone and video calling and messaging for effective communication. Utilize the fastest existing wireless networks and the most advanced network operator services. Take pictures to be proud of. The P990i has a 2 megapixel digital camera with video. Catch the moment and save it or send it. Show what your camera can do. 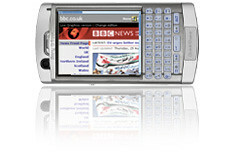 Symbian OS 9.1, the latest version of the most popular open smartphone operating system has been launched and the P990i has it. Add innovative applications to your phone and make it a powerful and effective business tool. Qumana have released a blog earnings survey which has found, unsuprisingly I'd note, that most bloggers make very little from their blogs.